This image contains the highest concentration of black holes ever seen, equivalent to 5,000 over the area on the sky covered by the full Moon. Made with over 7 million seconds of Chandra observing time, this is the deepest X-ray image ever obtained. These data give astronomers the best look yet at the growth of black holes over billions of years soon after the Big Bang. This is the deepest X-ray image ever obtained, made with over 7 million seconds of observing time with NASA's Chandra X-ray Observatory. These data give astronomers the best look yet at the growth of black holes over billions of years beginning soon after the Big Bang, as described in our latest press release. The image is from the Chandra Deep Field-South, or CDF-S. The full CDF-S field covers an approximately circular region on the sky with an area about two-thirds that of the full Moon. However, the outer regions of the image, where the sensitivity to X-ray emission is lower, are not shown here. The colors in this image represent different levels of X-ray energy detected by Chandra. 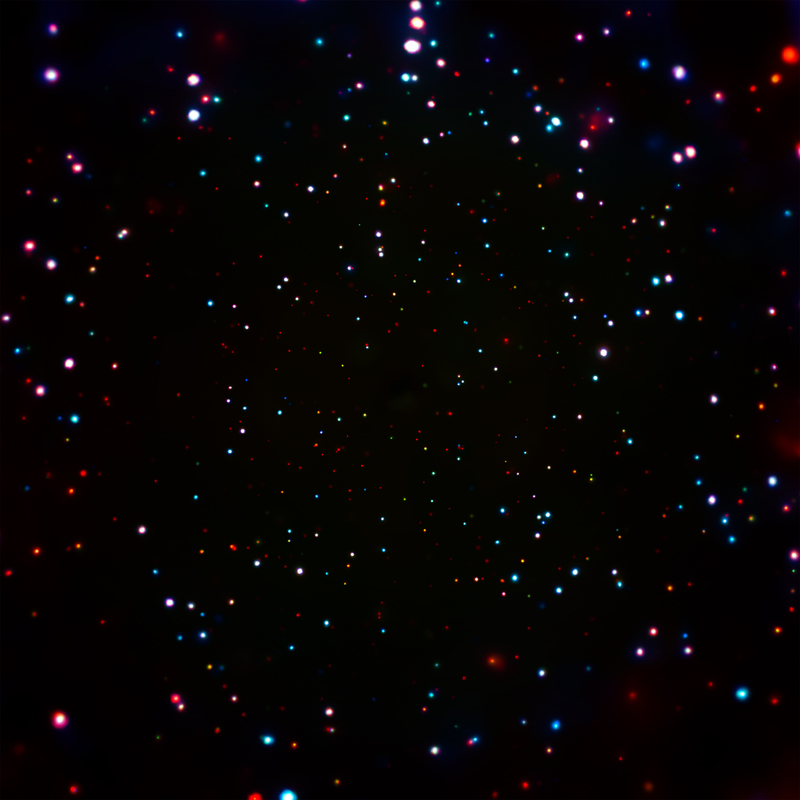 Here the lowest-energy X-rays are red, the medium band is green, and the highest-energy X-rays observed by Chandra are blue. The central region of this image contains the highest concentration of supermassive black holes ever seen, equivalent to about 5,000 objects that would fit into the area on the sky covered by the full Moon and about a billion over the entire sky. 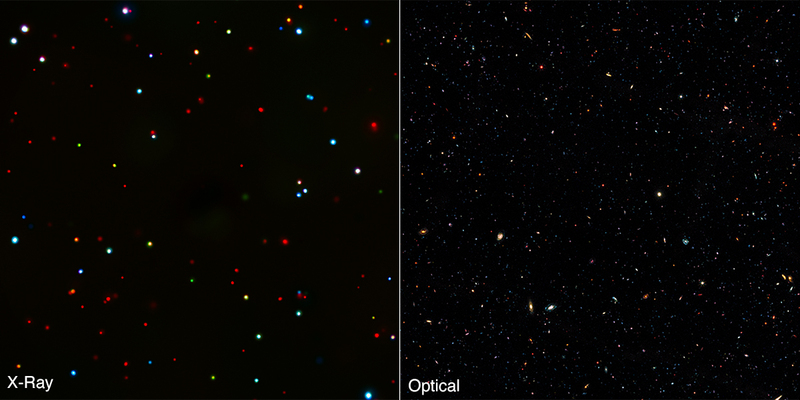 Researchers used the CDF-S data in combination with data from the Cosmic Assembly Near-Infrared Deep Extragalactic Legacy Survey (CANDELS) and the Great Observatories Origins Deep Survey (GOODS), both including data from NASA's Hubble Space Telescope to study galaxies and black holes between one and two billion years after the Big Bang. In one part of the study, the team looked at the X-ray emission from galaxies detected in the Hubble images, at distances between 11.9 and 12.9 billion light years from Earth. About 50 of these distant galaxies were individually detected with Chandra. The team then used a technique called X-ray stacking to investigate X-ray emission from the 2,076 distant galaxies that were not individually detected. They added up all the X-ray counts near the positions of these galaxies, enabling much greater sensitivity to be obtained. Through stacking the team were able to achieve equivalent exposure times up to about 8 billion seconds, equivalent to about 260 years. Using these data, the team found evidence that black holes in the early Universe grow mostly in bursts, rather than via the slow accumulation of matter. The team may have also found hints about the types of seeds that form supermassive black holes. If supermassive black holes are born as "light" seeds weighing about 100 times the Sun's mass, the growth rate required to reach a mass of about a billion times the Sun in the early Universe may be so high that it challenges current models for such growth. If supermassive black holes are born with more mass, the required growth rate is not as high. The data in the CDF-S suggest that the seeds for supermassive black holes may be "heavy" with masses about 10,000 to 100,000 times that of the Sun. Such deep X-ray data like those in the CDF-S provide useful insights for understanding the physical properties of the first supermassive black holes. The relative number of luminous and faint objects — in what astronomers call the shape of the "luminosity function" — depends on the mixture of the several physical quantities involved in black hole growth, including the mass of the black hole seeds and the rate at which they are pulling in material. The CDF-S data show a rather "flat" luminosity function (i.e., a relative large number of bright objects) that can be used to infer possible combinations of these physical quantities. However, definitive results can only come from further observations. Credit X-ray: NASA/CXC/Penn State/B.Luo et al. Coordinates (J2000) RA 03h 32m 28s | Dec -27° 48' 30.00"
It will help to get more information on black hole. Such technological improvement it help us to know the universe more. the images you see of gravitational lensing are of galaxies, which are large extended objects. Different parts of the images of galaxies are warped by the gravity lensing effect to different directions. Black holes, on the other hand, are essentially point sources. They can't be smeared by lensing effects because they are points, not large extended objects. The dispersion of black holes resembles air bubbles rising through water. How did this happen? do you think that this would eventually make its way towards earth? do black holes travel? I don't see any of the effects of gravitational lensing. Are x-rays immune to that effect? This is one of the most amazing windows into the universe I have ever seen. It is a clear picture of the great influence black holes must have in the evolution of the universe. Wonderful visualization of X-ray sources. A natural path of inquiry would be to select particular bright sources and use the separate measured data from different observational pointings to estimate statistical variation in x-ray luminosity over time. This may give insight into processes behind growth dynamics during the observed period in the universe's history. A view of deep space into the constellation Fornax. About 9 to 11 billion light years from Earth. X-rays from Chandra X-ray Observatory observed over 81 days.